There are legendary bad movies, and then there's the legendary bad movie. 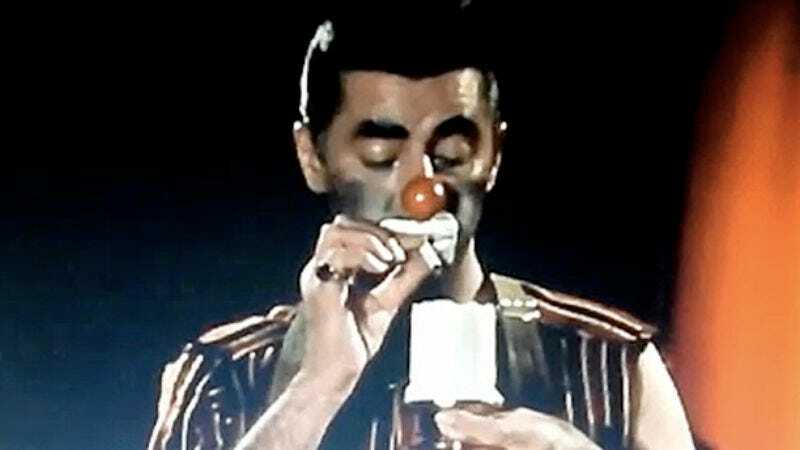 In 1972, Jerry Lewis attempted to make a Holocaust drama, The Day The Clown Cried. Lewis played a clown who was arrested by the Nazis for making fun of the regime, and then sent to a concentration camp, where he attempts to cheer up the children imprisoned there, ending with a macabre scene where he voluntarily goes with the kids into the gas chamber to ease their final moments. The finished product ended up being so unwatchable that Lewis suppressed all copies of the film, and only a handful of people have ever actually seen the movie. One of those—Simpsons actor Harry Shearer—described it as reaching an unattainable pinnacle of ill-conceived badness: "This was a perfect object. This movie is so drastically wrong, its pathos and its comedy are so wildly misplaced, that you could not, in your fantasy of what it might be like, improve on what it really is." And yet, much like life in a dinosaur theme park, the Internet finds a way. For the first time ever, footage of the film has surfaced. Much of it seems to be from rehearsals, as we see a circus big top with no crowd, and some odd voiceover that was perhaps destined for a trailer. But it's a fascinating glimpse of one of the strangest and least-viewed pieces of Hollywood ephemera out there.